In the final year of his life, St. Anthony of Padua, a famous Franciscan saint, known for his preaching, went to a small Italian village near Padua. 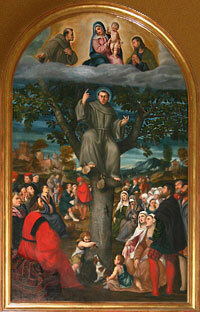 There he asked his brother friars to build a tree house for him in a walnut tree. There he spent his days in deep prayer and contemplation. People still sought him out, for spiritual guidance, or a good word. From my vantage point as a Secular Franciscan, a married man, and an ordained Catholic Deacon; I would like to offer my own observations, as I contemplate my Church, my world, and my life. I remember with happiness a fine upright Walnut tree, it did not have a tree house, but was a great place to rest.